God Wars: Future Past was definitely a game that sounded interesting to me. It's a grid-based strategy RPG with heavy influence from Japanese lore. It adheres to the tenants of the genre - each turn you can move and do 1 action, damage and accuracy from behind is better, and other such things. Once everyone has had their chance to do something, it moves over to the next turn. While being faster doesn't let you move more than other units, it does allow you to move sooner in a turn. MP starts empty, but you get a percentage every turn. This isn't so good for fighter classes (since their MP max is low), but great for casters...especially when you give them the MP+ passive. There are also two types of treasure chests strewn about the maps, plus hidden items. One unique aspect is gathering materials. There are sometimes special places that you can gather herbs, or mine ore, but you need an appropriate skill to do so. Side quests use the story mode stages, so you have plenty of opportunities to get these items, since you can repeat side quests. The game's story is broken up into 4 chapters, with several episodes (battles) each. Focusing on only the story battles should run you about 35+ hours, but much more if, like me, you do all the side quests. I found it best to not do all the side quests when first available, since it made my progression feel sluggish. Now for the job system. Ever since the first Final Fantasy Tactics (and Final Fantasy V), I've loved that idea. God Wars has it too, and I really like what they've done. Each character can equip two classes, a sub and a main, plus they always have access to their default job class. That's a total of three job classes, all giving active skills to use. The amount of JP earned is reduced for each successive class, but that's a good compromise for such a system. Sadly you can only equip three passives, which doesn't feel like enough when there are so many good ones (increased MP and JP are amazing). It's probably for balance, because having too many passives would probably make certain combinations overpowered. The story is pretty much fully voiced (at least in the PS4 version) story scenes, some of which are animated, and some others are more in a comic book style format. It's dual language, so you can set it to English or Japanese. Be warned that the animated scenes don't have subtitles. I found that some lines (in English) were really quiet, and were overshadowed by the music. Not terrible, but kind of jarring and strange. I set the game to normal, and it wasn't really that hard. Sure, some battles were harder than others (especially bosses that got multiple actions per turn), but none were super difficult. I'm not sure if that's because I play lots of SRPGs, or if the game isn't very difficult in and of itself. Also, some skills are far better than others, so learning those helps. One gripe I have is that enemies get better skills. One example is their magic damage reflect. Theirs seems to reflect all magic damage, but my skills, even at max, don't reflect nearly that amount. Accuracy can feel uneven at times, making misses at >85% more common than they should be. You can save in battle, which is nice, but you can't save scum to make those attacks hit. I tried it a few times, and it sadly didn't change. God Wars: Future Past is a very good, solid, and most importantly, fun strategy RPG. While it doesn't do anything revolutionary, being able to have multiple job classes at one time is a great start. I definitely recommend the game to SRPG fans, especially fans of the classic Final Fantasy Tactics. Fun, old school grid-based SRPG. They identify enemy: "It's Ookami." 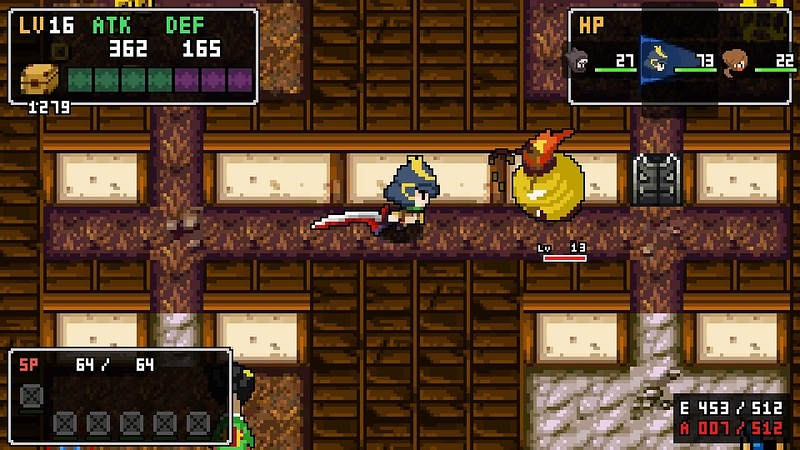 Having played a few hours of a previous Cladun, I was eager to try out Cladun Returns: This is Sengoku. Leveling up, maxing stats with magic circles, and even throwing in some Sengoku era characters sounded like a fun time. For awhile, it was. On its surface, Cladun Returns resembles a mystery dungeon game. While there are random dungeons in the game, the story mode isn't, but is instead an RPG. They are all pre-made, each is only 1 floor, and can be run through pretty quickly. There are locked doors that require either switches or killing certain enemies to open. The last stage of each area also has a boss monster to defeat. After completing each chapter, you also open up the EX stages that have Sengoku heroes to recruit. Combat is not turn-based, but in real time, giving some action to this RPG. You can freely move around the areas, attack monsters, and try to avoid getting hit. You can also run (which halves your defense), defend (which ups your defense...a little), and even slide (because reasons). There are several different weapon types, which are a bit different than each other. Knives are fast but have little range, swords hit a wider arc but take a split second to attack, spears have good range but won't hit right in front of you, staves shoot out magic but take time to recharge, so on and so forth. It's worth it to try them all out and see which works best for you (I prefer swords and knives). You also get combat skills, many of which are dependent on the weapon you have equipped. You have to actually go and equip the skills, which I didn't know. I did wonder why I didn't have access to my healing skill, which would have been useful early on. Unfortunately, the skills take a lot of SP to use, so you really need to save them. Getting more SP and HP is not too hard, because of Cladun's signature Magic Circles. Each class will unlock different Magic Circles as they level up. The character at the center is called the lord, and other characters placed on the circles are vassals. The HP of the vassals is added to the lord's effectively making the vassals the lord's shield. The vassals' SP is used to equip various artifacts to the circle, which will increase stats. Losing a vassal in combat will lose the stats they gave until you return to town. Learning to use and then master the Magic Circles is the key to understanding and defeating the game. There are also other ways to increase stats, such as the castle walls and, of course, equipment. It's a cool system that will likely require many hours to fully take advantage of. For the first 5 chapters, I had no real difficulties going through the story stages. I eventually found that my created samurai was better at fighting than my initial character (who could heal), so I started using him as a lord. Once I got to chapter 6, I got slaughtered. I figured it was maybe because I angered the ice ogre enemy and suffered his cheap attack, so I didn't do that the next time. Still got slaughtered. It was puzzling to be sure, since I had little difficulty up to this point. I did a few more quests, and a few more EX stages and tried again. No dice. I saved up and turned in a quest to get a good set of armor, and then I did much better. I'm fine with needing to upgrade stuff, but it's not as simple to see what is actually better. Plus it's a bit ridiculous to be totally fine one minute, then destroyed the next. 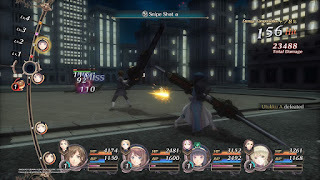 At various points in the game, you will encounter invincible or mostly invincible enemies. These are highly annoying because they can trap you. I've had several times where you end up down a narrow hallway, just to have one of those killjoys come in behind you, leaving you stuck. Your only options are to sit there and die, or quit out. Both are dumb, and avoidable if more thought was put into the game. It really soured the experience for me. Enemies will also chase you for near the entire map it seems, and they have several cheap attacks. The aforementioned ice ogres have a snowball shower that tracks you everywhere else in the stage, even if they can't see you. Super accurate/tracking shots when the enemy has no idea where you are is a pet peeve of mine in games. Just don't do it. However, if you can put up with poor designs like that, there are 10 story chapters and 10 EX chapters. Plus, there are randomly generated and much longer dungeons like the Ran-geon. You can also spend a ton of time leveling everyone up and min/maxing your stats. That last part I would really like, if not for the other stuff. I really liked the game for the first few hours, but some of the questionable designs put me off of it quickly when encountered. Lots of good customization and stat growth. Getting slammed with a difficulty wall out of nowhere, cheap enemies. I really liked recruiting the Sengoku people, since I've seen them in several other games. Awhile ago, Severed was a free Playstation Plus game. I downloaded it, but finally got the chance to boot it up and try it out recently. I played a bit of Guacamelee, and figured the game would be kind of like that. It isn't. Had I remembered their previous game Mutant Blobs Attack!, I probably should have realized they can make different kinds of games. Combat is very reliant on the touchscreen. You use it to slash enemies, and it will do so in the direction and length of you finger swipes on the screen. Most enemies require you to attack certain directions and angles to actually hit them. To avoid damage, you have to parry the enemies' attacks. This is probably the hardest part of combat. The timing and angle have to be very precise, and even more so for charged parries. Most enemies are open after being parried, and you will have to learn when you can attack. Thankfully most of them have big enough openings that you can go ham on the slashes to rack up the damage. Going ham on them is fun. At first I didn't really like the combat. Figuring out how to block, when to attack, getting the timing down, and accurately hitting the severs took a bit. After about 20 minutes, I felt much more comfortable, and did much better in fights. That isn't to say they were easy. Some were, but fights against multiple enemies can be a crap shoot. Usually you have to figure out which enemy to take out first, or which spell to use, and how to fight each enemy for it all to fall in to place. Since the game autosaves so often, you can quickly return to the last fight and try it again. Later in the game, you can fight in the clouds. These have a time limit, which is really just there to be annoying. It makes one fight notoriously hard. When not fighting, you will be moving around the different areas of the game in first person. The d-pad or face buttons (for left handed people, I presume) will walk you forward or turn you either direction as you make your way through the different rooms. There is some light puzzle solving, mostly consisting of finding the right levels to open doors, and sometimes running through them before they close. There are plenty of secrets to find, like health and magic upgrades. Some of them are obscenely well hidden (stupid levers). There's no teleport option, so you are stuck walking everywhere. It's kind of a pain when you are searching for the last few collectibles. However, the game still isn't very long. It easily clocks in under 10 hours, even if you find everything and get the platinum trophy. If you exclusively use a guide, it would be even shorter, but isn't necessary until getting the last few items. At the start, I didn't like Severed, but at the end, I thought it was a pretty fun game (except that crazy hard fight for one of the mementos). It has a unique style, creepy enemies, and won't take you very long to complete it. It's definitely worth trying if you got it from Playstation Plus, but I don't know if it's worth the default price. I would recommend picking it up on sale, though. Unique game that gets fun once the combat clicks. Combat is very unforgiving until it does, and even then there are a few very hard fights. The story is either too mysterious for its own good, or happens exactly as it appears. I wasn't sure what to expect when starting up Sniper Ghost Warrior 3, other than you probably play as a sniper. I figured it would kind of be like Sniper Elite, but what I got was something....better. The campaign starts off where most do: a video showing back story, then a quick tutorial mission. The prologue was actually more difficult that I would have thought. I failed the first time when trying to tag all the targets with the drone. I took too long to find everyone, and one guy saw the drone. Oops. Second time, I guess I took too long to shoot the target, but the game said "you missed the shot" even though I didn't pull the trigger. Ooookay, another reload. Then they told me the target was X distance away, so I shot that guy. Turns out he was the wrong one, and somebody saw him die. Oops again, and another reload. That was my last mistake in that chapter, but I was still worried, failing so much during the tutorial. Part of that stems from trying to learn the controls and part from learning how to adjust for wind. It's not something in most game I play, and it's always a bit different in the few that have it. At first, I didn't even know where the measurement was on the HUD, since my attention was elsewhere in the brief time I could hit the touch pad and read the tutorial page on it. Basically your scope can be adjusted close to the target's altitude, which can make your aiming more precise. After some more story, the game properly picks up. I was surprised to see that it takes place on a large, open map with many unknown places of interest and other things to explore and gather. Kind of like a sniper-focused Far Cry 3 or even the more recent Ghost Recon Wildlands. I was happy to see that, since I do like that style of game, and was eager to try out one with a sniper bias. The only trouble is, when presented with such a world, it takes me forever to actually do the story. I like to wander around and do the side activities. The 23 main missions and 16 side missions are spread over 3 big maps. That's a lot of points of discovery. Besides the scope mentioned previously, there are other things to learn while playing. Silencers are very helpful, but must be repaired to function. You have three different healing items, which you use by holding triangle. This is also used to loot weapons (breaking them down), so it's easy to accidentally use a medkit while trying to break down a weapon. It's not a deal breaker, but it is annoying. Like the actual sniping, after a few hours I was able to sort it out. Shooting was also easier and I had a good grasp of where to aim to accurately hit my target. Practice makes perfect...or at least something close. To round out the game, there are three skill trees. Certain actions grant experience in one of the three trees, and every 1000 will grant you a skill point. Each skill takes multiple to purchase, and I'm fairly sure you can end up with all of them if you play enough. You also get a multitude of equipable things, like gadgets, gun parts and drone abilities. You can also unlock new weapons, and switch between what you have purchased at your home bases. If you stuck to the main missions, the game would probably run 20-30 hours (especially if you are patient at sniping), but much more if you do all the extra stuff, like I do. The game's not too hard, as there are a few checkpoints during missions, and you can reload/retry pretty freely. As for problems, sometimes the stealth kills are glitchy, resulting in a body disappearing, or moving somewhere else nearby as you do it. There's also the load times. Reloading a mission takes a bit of time, but the initial load of your save file takes a ridiculous amount of time. Putting the game in sleep mode instead of closing it out helps with that. Sniper Ghost Warrior 3 was surprisingly fun. I wasn't expecting such detailed sniping mechanics, nor the open world with many points to explore and loot to find. The intricacy of the sniper rifle and the sometimes odd controls might chase some people away, but I'd recommend trying the game out. As long as you are patient, you will be rewarded. Open world with fun sniping action. Super long initial load, and the control configuration feels a bit weird. Why does a sniper shot through two heads not get old? The latest Shantae game has made its way to the Nintendo Switch after becoming available several months ago on other platforms. While I didn't get to review that release, I was very happy to review this one. Mostly because, after Shovel Knight, I learned the Switch was a good platform for this type of game, and Shantae: 1/2 Genie Hero shows why. I mostly used the 4-button d-pad on the Joycon, and for 2D movement, it worked great. Shantae's normal moves felt controlled and precise. I really like the Switch's 4-button d-pad, even though I didn't think I would. Jumping and attacking was also very responsive. The only parts where I found the analog stick was better was while swimming in the mermaid form. Especially the start of the last stage. The concept and game flow is fairly similar to before. You have to go to various places and collect something or other to advance the plot. The areas felt smaller than in previous games, and it also felt like there was less to explore. Most areas allow you to save after and before moving on to the next, which is nice. If you fall down a pit, you are sent back to the last of those, or the last door you went in. This made some parts a pain to do, especially the auto scrolling bits. They made sense in context, but I still don't like those parts in games. Didn't back in the day, and that hasn't changed. I will say this excludes the shmup section, since I love that genre. Platforming difficulty seems more balanced than the previous game. Yes, there are some tough bits, but the hard one near the end isn't nearly as bad as the one at the end of Pirate's Curse. Also the boss fights got easier. Maybe it's the multitude of healing items, but I didn't use them often. Before you had to learn their patterns, and now it is much easier to just power through them. Yes, that will turn some people off, but I appreciate it because I can play and enjoy the game, but see areas to improve if I want to invest the time. The beginning of 1/2 Genie Hero is harder than previous games, mostly because of the low starting health. If you get a game over, it sends you back a bit, but doesn't refill health, making it harder to progress sometimes. Bosses don't drop health increases like they used to, so you have to find them in the wild. I was struggling through the first and second dungeon, but once I increased my max health, I didn't run into trouble dying (but I still fell into pits). My problem with the game flow is how much they send you back to previous areas. In most games in the genre, you return with more abilities to get an item or two, but a lot of the secrets and items are left up to your discretion. Not so in 1/2 Genie Hero. They are helpful in hinting at where you need to go. Even so, I want to return to previous areas because I want to get items, less so because the game requires me to. It's not a deal breaker, but it's not a choice I prefer. It's probably to pad the game time, since it took me just over 7 hours to beat the game with 94% of the items. That was after wasting chunks of time looking for things I couldn't find. At least I know what areas I needed, since the map is great about showing what is available to find. Shantae gets a lot more dances than she's ever had before, some much more useful than others. The bat transformation and the warp dance are much more valuable than they initially appear to be. There's also a harpy one that lets you fly. It sadly controls terribly, which makes a part near the end a huge pain to deal with. As for upgrades and spells, Shantae has her usual assortment. Yay, pike ball! Thankfully money is much easier and consistent to come by than previous entries, so the upgrades felt much more evenly spaced. Overall, I really liked Shantae: 1/2 Genie Hero. It has some improvements over the previous games, even if I think it forces you back to the same area too many times. While it's only about 7 hours for the first playthrough, it's appropriate for the genre and price, and there is an unlockable mode if you are so inclined. Plus, the art and animation are still top-notch and beautiful. Action/platformer fans should definitely check it out. Very fluid and precise controls on the Switch. Looks great, too. Forced, multiple retreads of areas. The Grandma Blobfish and the palette swap lines were very funny. As a fan of most Idea Factory and Compile Heart games, I was eager to try out Dark Rose Valkyrie. It sets you in a world where a virus is turning people into monsters called Chimera, and you head up a special group tasked with fighting them and keeping citizens safe. The game started off pretty strange, by offering me the three difficulty levels of easy, hard, and very hard. So...no normal? The one difficulty level you should have is not present? Well, against my better judgment I went with hard. For the most part, it worked out pretty well except for some boss and mini-boss fights. It just involves more grinding. After about 30 hours I put it down to easy. You get more experience after fights, but quest rewards are reduced. Grinding does actually take time, since the game sports day/night and moon phase cycles. As you spend time in the world map, it will slowly move from day to night, and back to day again. After each day, the moon shifts forward one phase. While you are in a dungeon, time will pass, but it will not be reflected as long as you are inside. Once you leave, it will jump to where it is supposed to be. This is helpful for the times when you need to fight a monster that is only around a certain time of the cycle. However, enemies are stronger at night. Unfortunately, the first time you do a dungeon, it will always be night. Seems a bit steep to me. Thankfully you won't waste time walking back to a dungeon, because there is a very helpful warp feature. There are a few warp points scattered around each dungeon and the world map, and you can fairly easily warp among them from a warp point or a save point. Sadly, you can't warp to a save point, which would have been nice. Especially since they don't always have great placement for the warp and save points. You can work with them, but they aren't in the most convenient locations. Combat is some good old fashioned turn based goodness. On the left side of the screen is a long bar with icons for everyone in the battle. Your icon moves up (based on your speed stat) and you can take action at an appropriate time. If you have played any of the Grandia games, you will quickly realize the basics. When your turn comes up, you can attack, charge attack, use a skill, or even switch to your back up character. The attacks have three different levels that you set the combo for, and each higher one is stronger, but takes more time before you do it. For whatever reason, I stuck mostly with the level 2 combo for 90% of my attacks. While hitting an enemy, their icon is stalled, which makes fighting one target easier than a group. The charge attack will knock an enemy's icon back a bit. I rarely used this, since the benefit is about equal to stalling them while you do a normal combo, but you get higher damage doing that. Skills are things I mostly used on boss and mini-boss fights, at least in the early stages to knock down the extra targets. There are plenty of elemental attacks in there to take advantage of enemy weaknesses, but no way to change your attack type (strike, slash, pierce). There are healing skills, but they felt very weak versus the damage strong monsters could do. Not good. It was better to use them between fights and instead rely on expensive items for battle. Since it is a Compile Heart game, enemies have guard gauges. If you deplete it before their icon starts over at the bottom, you get some extra damage, plus your EX attack at the end of your normal combos. You also build up TP while attacking, which you can use to defend from an enemy's special attack (SUPER useful) or unleash a powerful sync attack. Using it for defense felt necessary for the boss fights (especially on hard), but using it for attack was more fun and flashy. After you execute an EX move, the person behind you may rush in to get in a few more hits. 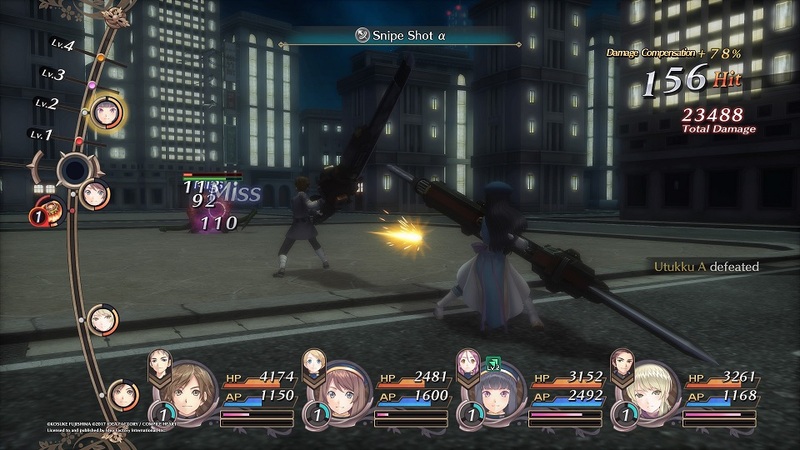 Afterwords, you can choose to spend 1 TP for a total (all enemies) or single (the target) sync attack. The entire backrow will appear an unload their shots on the foes. It's fun, and useful to rack up the hit count for extra damage and reward and the end of the fight. Problem is, they don't always seem to activate when you actually need them, and instead are available many times when weak targets are already dead. Lastly, your characters can use TP to activate a power-up for a few turns. Called Ignition, it boosts your stats and protects from status ailments. Honestly, I rarely ended up using it, which may explain why some boss battles are hard. In my defense, I needed the TP to block (so I don't have to use the weak heals), and therefore didn't really have it to spend otherwise. Also, the stat boost didn't seem that great, but I always appreciate abnormal status protection. When not fighting or exploring, you will be spending your time at the ACID base. Here you can make new items, sell items, rest, and accept quests. They don't call it "sell items", so it took me a bit to realize that was what turning them in was. The last section of items to turn in will give money and also components that you need for powering up your weapon and making pieces of equipment, so make sure to sell some of those when you get the chance. You can also talk to party members for extra events, which will affect their relationship with you (and the ending). The game follows a fairly simple path: event(s) in base, go to dungeon, return, event(s), do missions, return, rinse, repeat. A lot more of the missions are required than I thought. Even so, I was stubborn about doing all of them, even those not required, before moving on. I didn't really run low on days to turn them in, either. To mix things up, interrogations have also been included. You see, not everyone is who they appear to be. One of the group is a traitor, and you (Asahi) have to figure out who it is. 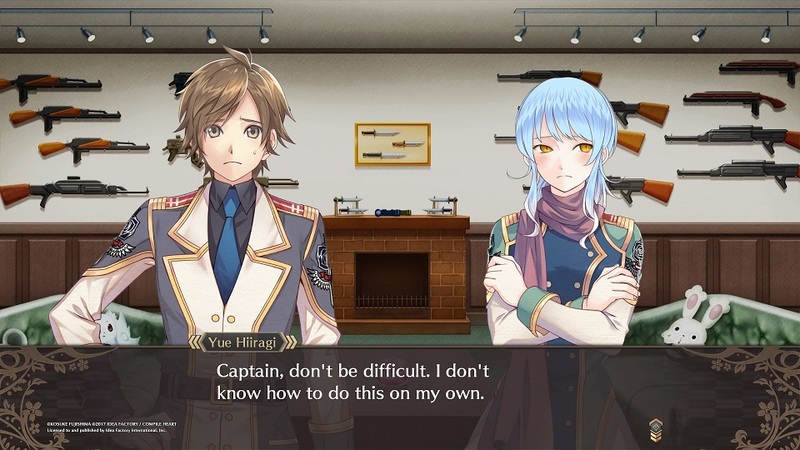 To do that, you will question characters about themselves and the others at a few points in the game. These were...ok...but I found it odd you could only ask so many questions. Yeah, it's probably to make it harder, but it feels a bit too limiting and hard to put it all together in a satisfactory way. Even though I enjoyed Dark Rose Valkyrie and its high-hitting combo battles, there are a lot of little things that bug me. Money is really hard to come by early on, story dungeons force it to be nighttime, and boss battles are aggravating on the hard setting (sometimes on easy, too). It should take well over 40 hours to complete the game, especially if you try to do all the side quests like me. Still, I'd say it's worth trying out for JRPG fans, even if you were put of by some of Idea Factory's non-Neptunia offerings. I recently got a code for the PC release on Steam. While most PC releases of games I have already reviewed run well, Dark Rose Valkyrie broke the streak. The story and dialog scenes ran perfectly fine. Battles and moving around the map were choppy messes. It looked like it was running at 10 fps. I'm not a stickler for graphics, but it should not look like a failing flip-book animation. Audio seemed to skip at times. Battles aren't hampered by the choppiness, but they look bad. On the map, the bad frame rate makes getting those first strikes all but impossible. At first I thought maybe running on higher settings, or on a hot day, made it run so poorly. I turned the settings down to low (which seems crazy for my i9, but I digress), and ran the game on other, cooler nights. There was a slight improvement, but not one that actually helped. I'm not sure what happened to this PC release, or if there is something amiss on my machine, but it ran poorly. If you can, stick to the PS4 release. Fun combat in a completely stand alone game. Lots of little nitpicks, like the high damage you take and the low amount of healing, among others. The Caligula Effect starts with an interesting premise: students are trapped in a virtual world, and go through high school on a continual loop. The thing is: many of those people want to be there to escape reality, and don't even know they are in a virtual world. I don't know why anyone would think of high school as a paradise, but I digress. Your main character is one of a select few who awakens to this reality, and sets out with fellow students to set things back to normal. To do so, you have to find and stop the virtual idol, Mu (it's written as the Greek symbol). Like most RPGs, you run around a map, get into fights, and solve quests. The locations in the game are appropriate to the setting: things like school and the mall. Enemies and NPCs roam around, and fights take place when and where you engage the foes, which can be problematic. It's usually possible to sneak around enemies as they roam. Aria does say the Digiheads (aggressive students who fight you) have bad eyesight, and boy, is she right. Well, if you out level them anyway. You will probably fight a lot of them anyway, and they do respawn. Sometimes a bit too quickly for my taste. Even if you avoid a lot of them while running around the dungeons, it can take several hours to get through each one. Fights in The Caligula Effect are the game's most unique aspect. When you select a skill, it shows you the likely outcome of that attack. Things like damage, countering, etc. can be planned in advance to make the most of your turn, and destroying a target quickly. The game actually rewards you with double experience if you can win in one turn. Some skills are counter skills, which can cancel certain types of attacks. I shouldn't have to tell you how useful that is. Some skills launch a target, or knock them down. Some will do extra attacks if the target's "Risk" is high enough. Some skills will benefit from hitting targets in the air or on the ground. The bottom line is: plan out your attacks to get the most out of them. To facilitate this, you can delay the timing on them. This is pretty useful, and has great synergy with the predictive function of combat. Unfortunately, you can't skip or delay your full turn if you wanted to wait until another character is ready. You can string together up to three attacks, each one costing a reduced SP cost, which will really pile on the damage, and take advantage of launch or otherwise indisposed targets. It seems a bit more complicated than it ends up being, even though it does look really chaotic when you have four party members all attacking some poor sap at the same time. Once you kind of get how the attacks work, you can set them and have a pretty good idea what's going to happen. As such, a majority of my fights ended in one turn. This is all well and good, but what about bosses and strong enemies? Sadly, that's where the battle system is weakest. Planning the small details of a turn and timing everything properly is great and all, but if the enemy survives it (or if they aren't launched)? You are left just hitting them with stuff and hoping they eventually die. If an enemy is a higher level than you, the damage you deal is cut down drastically. You will probably run out of SP in a turn or two, depending on character, and then have to sit there and use the charge skill for it to come back. It quickly becomes a chore to finish those fights. I do really like the battle system overall, so it's a shame that it can crumble so quickly. Equipment is also pretty unique. Instead of more traditional stuff like armor, you gets "stigmas", which are more like personality traits. They affect your stats and can even give different skills. There is also a rarity scale to them, so you can get stronger versions of each one. The skills you can use in battle have the normal range of attacks, defense, and support abilities. Honestly, I rarely used anything that wasn't an attack, the SP recharge, or the occasional emergency barrier. I never really had the need to. The points you use to buy skills are earned by gaining a level, winning some fights, and finding discoveries. They are also stored in a communal pool, so all the characters share the same stockpile. This can make it harder to save for the ultimate skills, since you may want to flesh out each character's other skills first, but you can gain more by leveling up the NPC students if you are a bit low. Even though you are mostly a silent protagonist, there are many times you can make a dialogue choice. I'm not sure how much each choice actually affects things, though. Well, except for getting through the library. Anyway, you will also end up chasing fellow students around and talk to them to raise their friendship. A lot of chasing, and a lot of talking (it raises slowly). I did like seeing new people, but it is a bit daunting to have so many possible people to talk to, and multiply that by the number of times you have to talk to them. Sheesh. There are also little quests where they may want to meet certain people, or go to a certain place. It doesn't sound that hard, but with 500 students, it's going to be a long process. I'm not sure it's worth it just to be able to use them in battle. The Caligula Effect isn't really a hard game, even on normal, provided you understand (or can at least use) the combat system. I only really had trouble on a few enemies that were just above my level (because of the low damage), and for that reason I tended to avoid them. You get most of your HP and SP back after a fight, so going through the dungeons wasn't too bad except for all the running back and forth you do. The bosses are more difficult than normal fights, but not by much. The story will run you over 30 hours, but there is a new game plus and some post-game stuff. A lot of what The Caligula Effect has to offer is its unique battle system. The story is pretty good, and I liked the dialogue, but the fights are what really set it apart. They seem a lot more complicated than they ended up being, and I can easily see it turning off some people. I'd recommend sticking with it if you can, as the game is pretty fun. A solid RPG offering on the Vita. One final note: I've heard chatter of a bug that erases your save file near the end of the game. I have yet to encounter it, and hopefully never will. Make sure to back up to the cloud and be careful! That falls apart if a battle takes too long. "Archive of Regrets" is a great name for a location.